Mr. Monkey saw Tim Gunn walking on the sidewalk tonight. Did Mr. Monkey say hello? Did he wave? Did he even smile? No. Instead, he called me. And Mr. Monkey is going to the premiere of The Express on Thursday, too. He didn't even at least snap a picture?? I can't wait to see The Express! I hope it's as good as the commercials make it seem. I LOVE Tim Gunn so much. So lucky is Mr. Monkey. i can't imagine mr. monkey waving OR smiling at mr. gunn. haha! 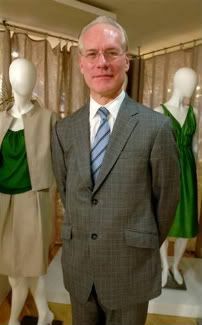 I <3 Tim Gunn ... I think I'd freeze up if I ever saw him on the street. My neighbor saw Tim Gunn at Mood. She didn't even tell him to make it work. I was so disappointed. Ugh, I love Tim Gunn! Smack Mr. Monkey over the head for me.....holla atcha boy! I have no right to say anything cause every time I've run into a celebrity, I've frozen and failed to do anything. i am like mr. monkey when i spot celebrities. then i go home and kick myself. sigh. Ahhh! He didn't even manage to yell out "carry on!" ? So sad! and then begged for him to take me shopping.